Gas hydrates are solid, ice-like crystals in which gas molecules - mainly methane - are trapped in the structure of solid water. Natural gas hydrates occur on continental margins and shelves worldwide from polar regions to the tropics, and their energy content is estimated to exceed that of all other fuel sources combined. In European waters, hydrates in the Black Sea and the Arctic Ocean are of greatest interest. Gas hydrate is a clathrate - a chemical substance consisting of a lattice of one type of molecule trapping and containing a second type of molecule (pictured right). It is formed under very specific temperature and pressure conditions when molecules of methane become physically trapped within water ice. In the deep seabed, vast amounts of methane are produced by the decay of organic matter and as a by-product of microbial activity. As the methane rises towards the seafloor, it reaches a zone known as the Gas Hydrate Stability Zone (GHSZ), where the pressures and temperatures are right for the methane to become trapped as gas hydrate. Molecules of water ice within the marine sediment trap methane and form a 'cage' by freezing around the methane molecule, thus forming gas hydrate. Gas hydrate is stable under specific temperature and pressure conditions within the seabed. The depth below the seabed at which gas hydrate forms is completely controlled by the temperature/pressure conditions, so in some areas this means that gas hydrate occurs at great depth below the seafloor, and in other places - where the temperatures are low enough - hydrate can occur at or just below the seabed. In all cases, gas hydrate will only form if there is a sufficient supply of methane. 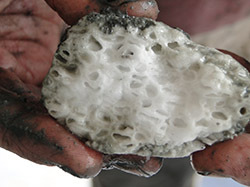 In marine sediment, gas hydrate usually appears as an white, ice-like substance that often forms lumpy crystals or layers within the sediment. When gas hydrate is brought to the surface, the reduction in pressure and increase in temperature causes the clathrate structure to break down (dissociate), releasing the methane from its 'cage' and allowing it to escape as gas. Gas hydrate reservoirs are generally associated with biologically rich cold seep ecosystems at the seafloor. These hotspots of biomass and biodiversity are highly localised and fragmented. They contain specific types of organisms associated with reduced environments. Furthermore, hydrate-bearing sediments are associated with slow-growing, methane-consuming microbial communities and other sub-seafloor life, which play an important role as a barrier against the release of the potential climate gas methane and toxic hydrogen sulphide. The use of natural gas hydrate resources as an energy resource is an active area of interest in Germany (SUGAR project), USA, Japan, South Korea, India, Taiwan and China. Research has focused on exploration and exploitation techniques, but the potential hazards associated with these new technologies have so far been largely ignored. Destabilisation of the seabed is regarded as the major risk during gas hydrate exploitation, caused by over pressurisation in the sediment pile as the gas hydrates dissociate and/or the migration of gas bubbles through the muddy overburden sediments. While both processes have been studied to some extent in laboratory experiments, only limited data are available on geotechnical parameters under in situ conditions, despite field data clearly showing a strong link between fluid migration within sediments and slope stability. Migration and seepage of gas bubbles are found ubiquitously in gas hydrate deposits. Both processes are also expected to destabilise gas hydrates as a result of seafloor warming, making the Svalbard margin and the Black Sea prime research areas. There are currently three main extraction methods for gas hydrate that may be applied independently or in combination: 1) pressure reduction, 2) heating and 3) injection of carbon dioxide. Each extraction method has its own technical advantages and disadvantages but the environmental and economical impacts are largely unknown. The potential impacts will depend on the extraction method, the dynamics of the gas hydrate system, the depth below the seafloor at which the hydrates are present and their spatial distribution, which is strongly controlled by the stratigraphy and lithology of the sediments. MIDAS will determine geohazard and climate threats from the exploitation of gas hydrates.